Pai Instant Calm Camellia & Rose Gentle Hydrating Cleanser - 100ml - $50, 200ml - $70 - with a luxurious cream formula that effectively melts away make-up and impurities without the slightest irritation or stripping away natural oils - with an advanced cleansing formulation that is enriched with an expert blend of skin-conditioning vitamins & omegas including: camellia - a rare oil has been used in Japan for centuries as a skin cleanser and conditioner, packed full of Omega 3 and vitamins A, B, C & E; and rose - which has amazing regenerative, restorative and moisture-locking properties, to leave skin beautifully toned and hydrated. I really like how it works with the included organic muslin cloth which gently exfoliates while cleansing the skin to reveal brighter luminous skin. Visit www.paiskincare.com for more information or to purchase. 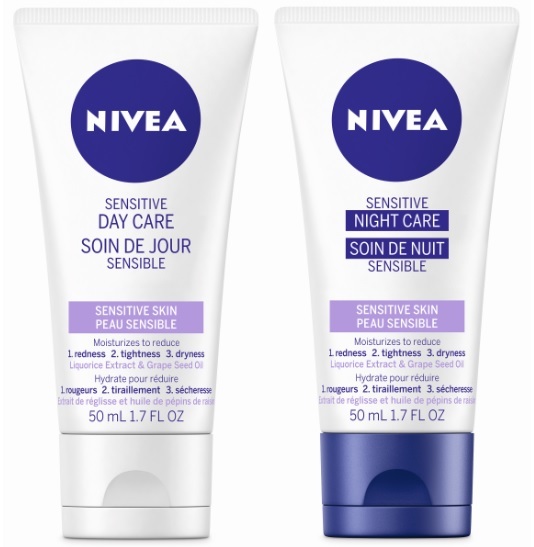 Nivea Sensitive Day and Night Care - 50ml - $8.99 - with a mild, pararben, colourant and perfure-free, pH-neutral formula that provides intensive moisture while instantly relieving skin from the unpleasant feeling of tightness. The formula with Liquorice Extract and precious grape seed oil, effectively reduces redness due to dry skin to soothe the skin during the day and replenish skin’s moisture at night, providing a relaxed feeling in the morning. Live Clean (Baby) Perfume Free Tearless Shampoo & Wash and Baby Lotion - 300ml/227ml - $6.99 - the wash has a mild formula that gently cleanses while softening skin without drying and is enriched with certified organic botanicals and essential oil of apricot; while the lotion has a extra gentle, hypoallergenic, non-greasy plant derived formula that's enriched with vitamin E and certified organic botanicals - which make them smell great without the need for artificial fragrances that can irritate your skin.